United Airlines is showing 2-in-1 trips that allow you to visit both Shanghai, China and Taipei, Taiwan for $588 CAD roundtrip including taxes. The flights have 1 stop on the way to Shanghai. Non-stop from Shanghai to Taipei. And then 2 stops on the way home from Taipei. NOTE: Canadians require a visa to visit Shanghai, if you're staying longer than 144 hours (6 days). 2. Try other dates in the months listed above. Focus on Monday, Tuesday, and Wednesday dates for the 1st and 3rd flights. 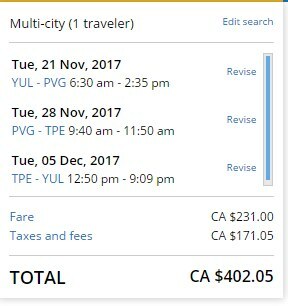 For the flight in the middle, you can try playing around with the date on Google Flights to give yourself more or less time in China vs Taiwan. 3. Select your flights and click through to the United Airlines website. 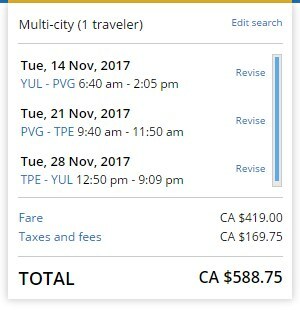 Update 9/1 - These just dropped to $402 CAD roundtrip! 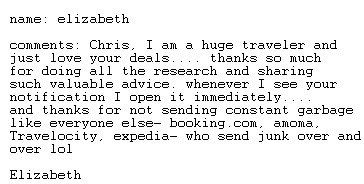 montreal, yul, flight deals, asia, east asia, china, shanghai, pvg, taipei, taiwan, tpe and united airlines.